Steamed Salmon for Dinner — Kitchenpostcards Dinner in 30 minutes! Dinner is always a tricky meal, it’s the end of the day, chores need doing, and the food that goes into our bodies not only needs to be on time but nutritious and delicious. I’ve always enjoyed salmon fillets for dinner. 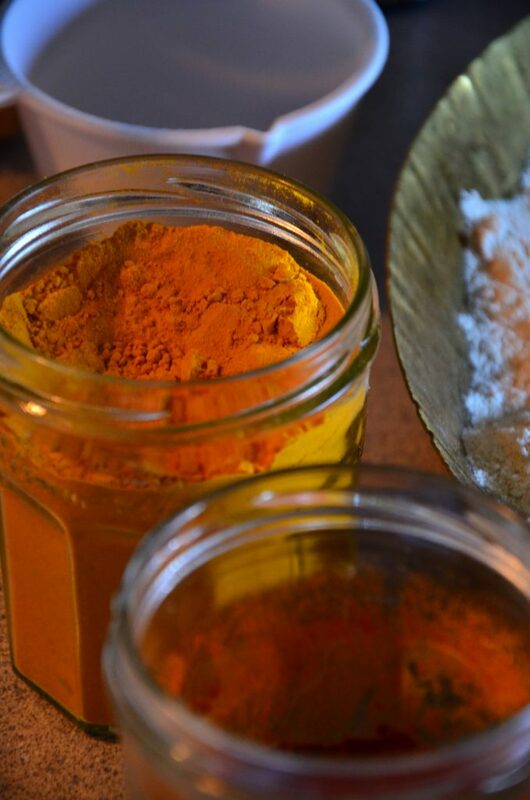 A recent effort to rebalance our diets put us on the path to try simpler foods. And here we are, with an entirely steamed meal of steamed salmon with greens and a peanut pesto pasta. 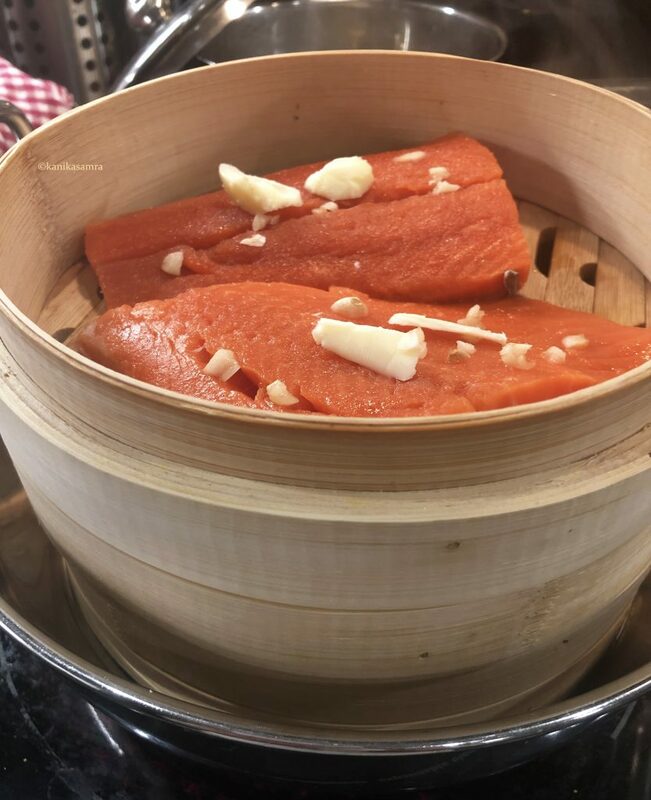 Steaming Salmon: what’s that all about? Pan fried salmon works perfectly well, so why steam it? Because you can. And frankly, I cannot think of much more! With a bamboo steamer, the meal practically cooks itself. Vegetables in the lower shelf and salmon on the top. Fish is very easy to overcook, as I’ve found since I started cooking some. 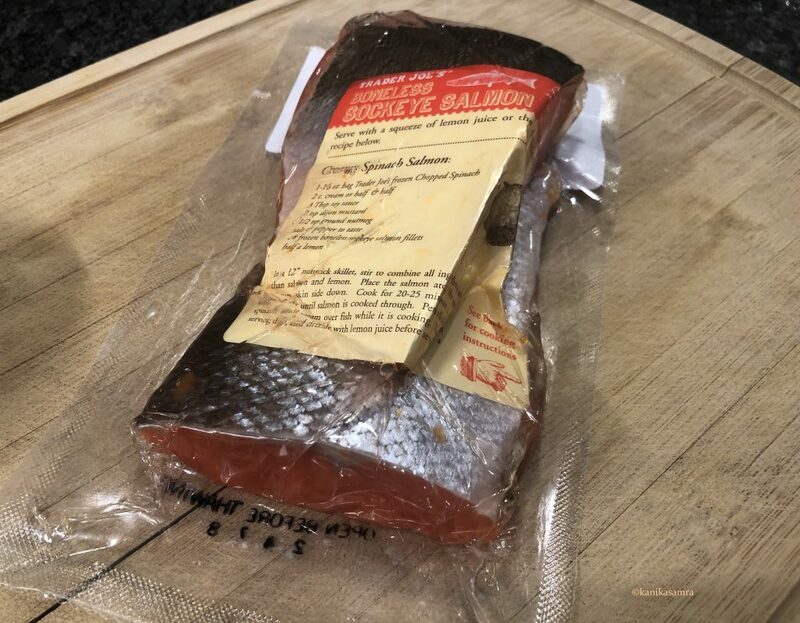 Whether in a pan or a steamer, a few extra minutes can turn a juicy filet of salmon into a rubbery, stiff piece of meat. And that’s no fun to eat! 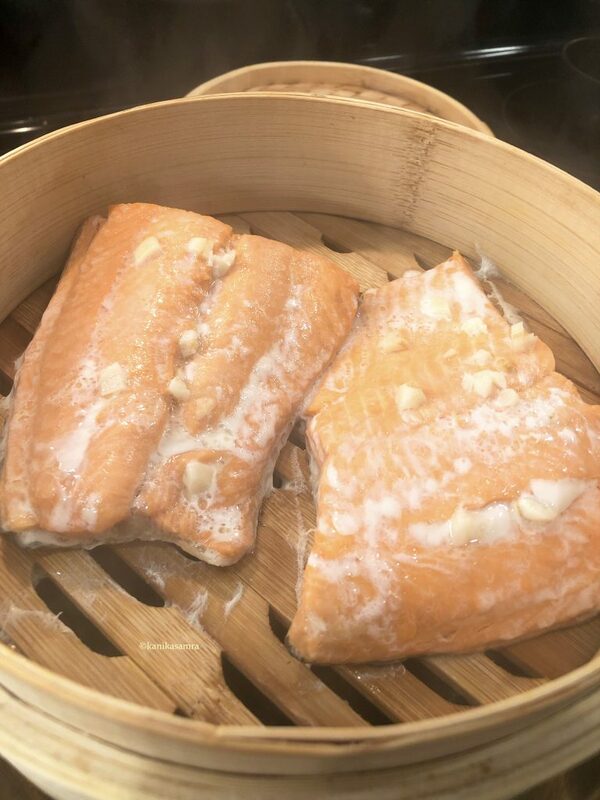 Steaming salmon filets with garlic and butter in a bamboo steamer. There is a pretty neat guide to cooking Salmon by Florence Fabricant on New York Times Cooking. While she mentions poaching salmon, she doesn’t say anything about steaming it. I devised my own way to get everything ready on time. The bamboo steamer comes very handy for this. Olive oil – 1 to 2 tbsp. For the spinach peanut pesto: refer to this recipe! For the salmon, bring the filets to room temperature and then rub salt on both sides. Tuck in garlic wherever there is space and then put a tablespoon of butter on top of each filet. Prepare a deep wok or pot for steaming. Add water that is about 3-4 inches deep and bring it to a boil. Place the steamer in the water bath. On the lower shelf add vegetables. Put some salt on them and if you like add a bit of butter. Place salmon filets on the second shelf and stack it on top. Cover with a lid and steam for approximately 20 minutes. Keep the pot on low or medium heat, just enough to keep the water simmering. You will need to keep an eye on the water level. If the wok/pot gets too hot water will evaporate completely. Keep refilling as needed. While dinner steams away, prepare the pesto. The peanut and spinach pesto is a really simple twist on the original basil pesto. It still uses basil leaves, garlic, olive and salt but replaces pine nuts with almonds and roasted peanuts. The spinach adds bulk to this sauce. Follow this recipe. Feel free to experiment by adding other herbs you enjoy. Keep this aside while you boil pasta and check in on the salmon. 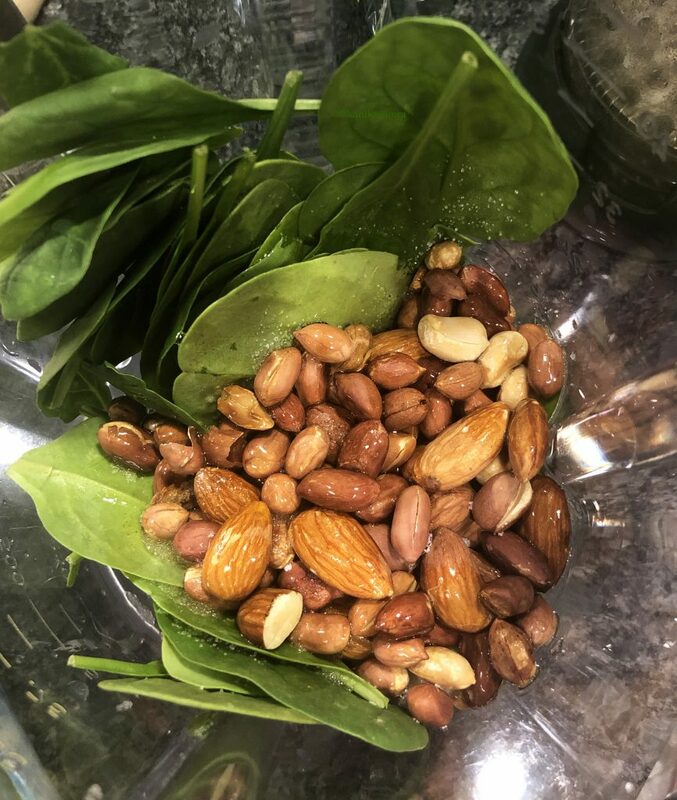 Peanut pesto with spinach and almond. When is the salmon ready? 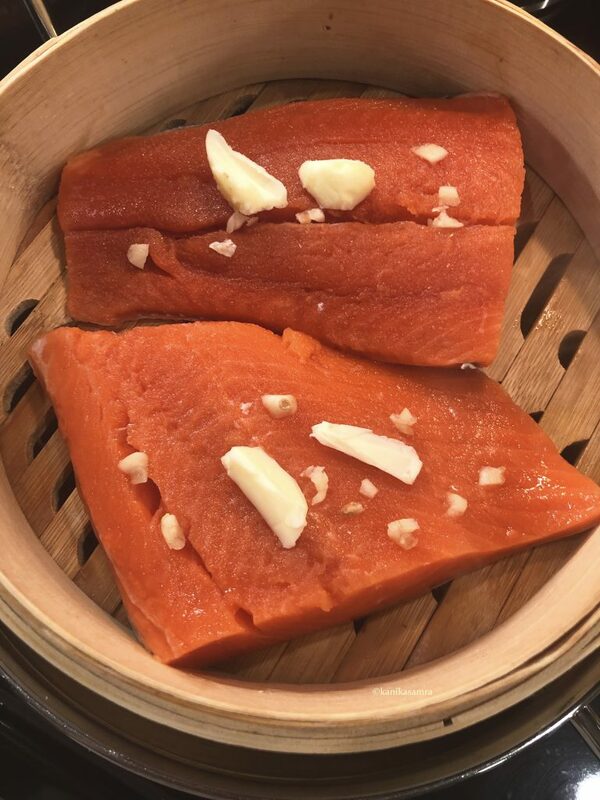 Raw salmon can be a bright orange to pink in colour. The Sockeye Salmon used here was pinkish-orange when raw. In terms of actual colour palettes, a pale pink to muted orange with shades of pink – somewhat peachy, is associated with the colour Salmon. 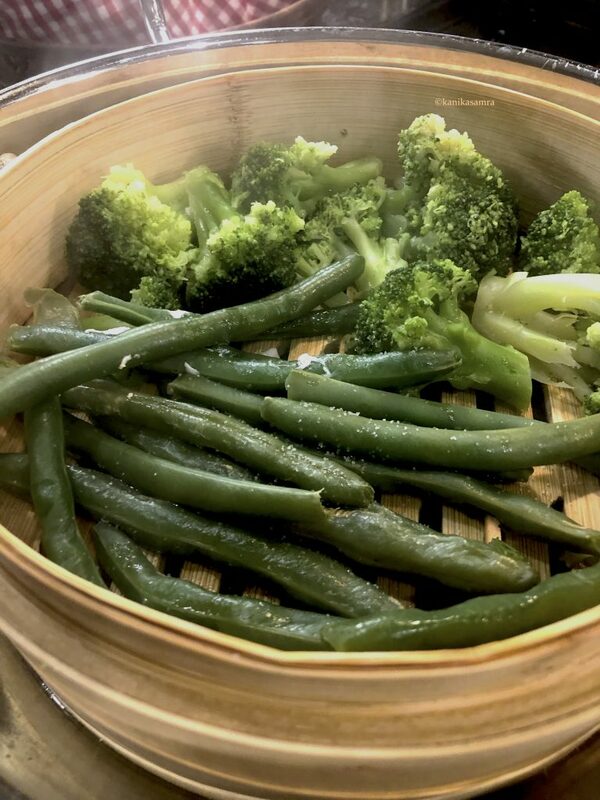 Steamed greens for dinner – french beans and broccoli. That’s the colour you are looking for. As the fish cooks it will change colour and become paler. Often coagulated proteins will ooze out as a white stringy substance. At this point it’s definitely cooked. (Don’t be afraid, all of this is edible!) The flesh will be flaky, easily separated with a gentle nudge of the fork. If you prefer it rarer, take the filets off the heat at about 12-15 minutes, before proteins rise to the surface. 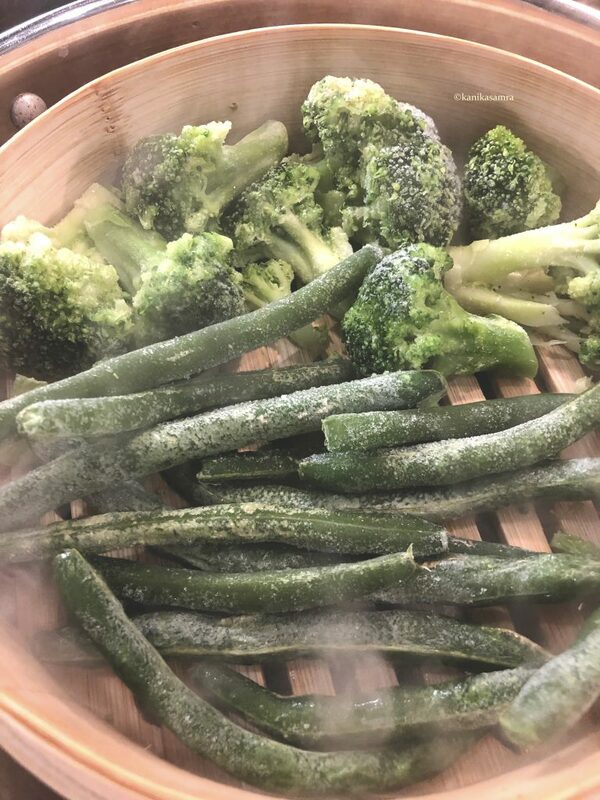 When blanching or steaming greens like broccoli and french beans the colour to look for is a bright green. That’s the perfect time to take them out. In the steamer frozen vegetables take about 10 minutes to reach that point. 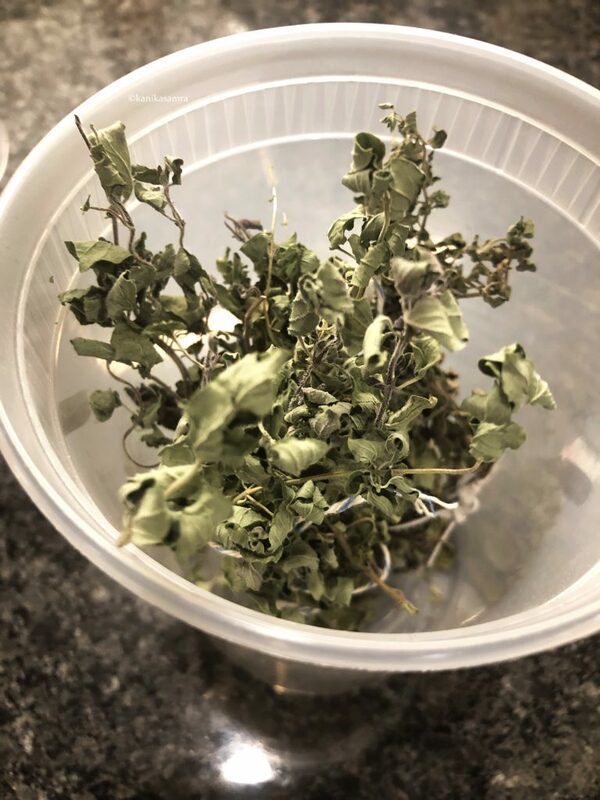 Homegrown and dried oregano bunches. Once the pasta was done, I strained it and ran some cold water through it. That stops the cooking process. If you boil pasta until its al dente, then skip the cold water rinse. Pour about a tablespoon of olive oil and toss to coat well. Then sprinkle some oregano on top. You could also sprinkle a dash or salt and black pepper. Or for a kick of heat some crushed chilli flakes. 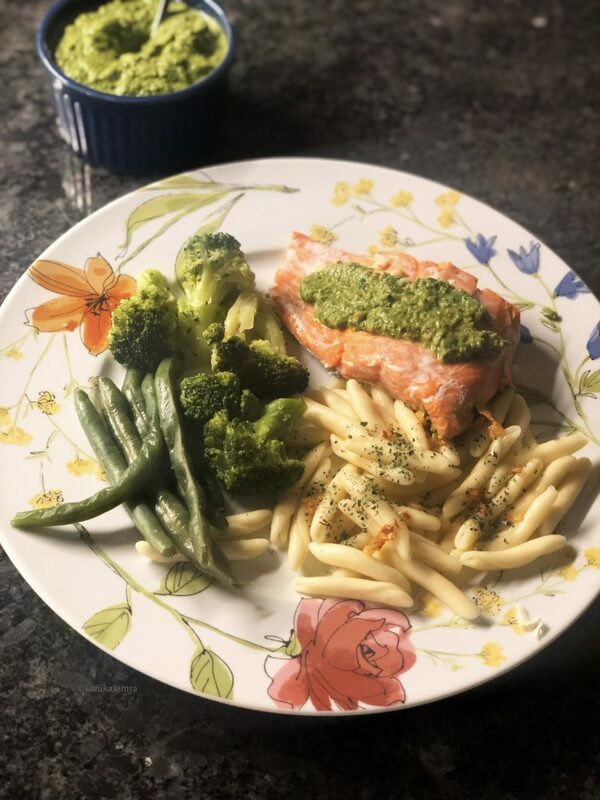 Serve each salmon filet with pasta, pesto, and greens. That’s it, in under 30 minutes a nutritious dinner for two is ready to eat.